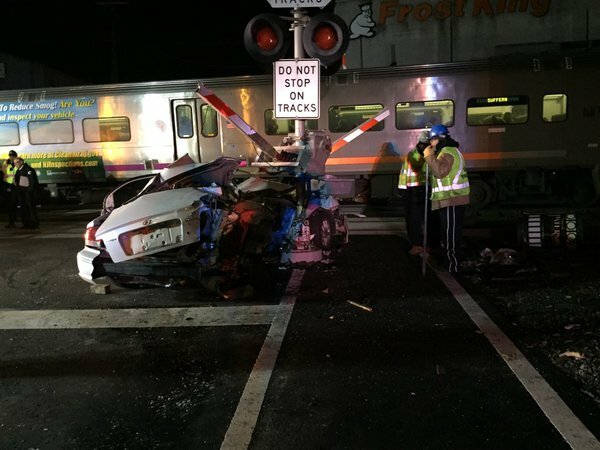 Photo of the NJ Transit train & crushed Hyundai Sonata courtesy of Twitter user @andrewtavani. A train struck a vehicle in Paterson Thursday night, a spokesman for the agency said Thursday. The accident involved the #1125 train to Suffern from Hoboken and a white Hyundai Sonata driven by a 29-year-old Paterson man, Cristian D. Vasquez. The collision occurred at the 5th Avenue grade crossing around 7:30 p.m., NJ Transit spokeswoman Nancy Snyder said. None of the approximately 400 passengers or crew aboard were hurt. Vasquez was taken to St. Joseph’s Regional Medical Center. His condition was not known, Snyder said. He has been issued motor-vehicle summonses for reckless driving, driving while suspended and for disregarding a railroad signal. First & foremost, I am glad that none of the nearly 400 riders & crew aboard the train were injured. As far as Cristian D. Vasquez is concerned, his license should be permanently revoked as his actions could have had fatal consequences. He needs to pay for his mistakes in the harshest way possible as driving is a privilege, not a right!